A Zimbabwean inventor has alleged infringement of his intellectual property rights by a South African company, which he says went on to manufacture a unique mop after he approached its management. Ronald Shangazhike of Norton says the Addis Butterfly Mop now on sale in Zimbabwe, South Africa, the UK and other countries was his idea. â€œWhat you now know as the Addis butterfly mop was invented and originally patented in Zimbabwe in 1994,â€ said Shangazhike, who provided sketches of the cursory patent done more than 20 years ago. Soon after getting a Zimbabwe patent number, he started to look for a possible manufacturer with the intention of jointly exploiting the invention. He says he approached Usabco Industries (Addis South Africa) based in Cape Town and they asked him for a sample, which he constructed and sent to them in April 1995.
â€œThey wrote back after receiving the sample saying they would never use my design in any way, but they never returned the sample,â€ said Shangazhike. The Usabco Industries faxed response of July 1995 read: “We have received the sample that you sent to us. 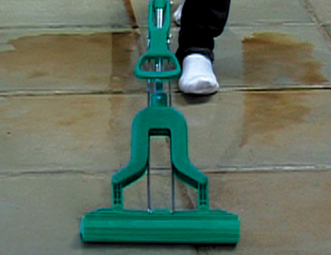 While we felt that the mop was very well designed and constructed, the mop would be too expensive to manufacture. According to Shangazhike, Usabco then sought international expertise and in 2007 launched the very same butterfly mop that they had declined from him, which had been registered in Zimbabwe as patent number 13/94. In May 2012, Shangazhike made an inquiry after seeing these mops in local shops. But Usabco, unlike in the past when it communicated directly with him, advised him to communicate through their lawyers. The mops are being sold through such retail chains like Makro and Pick â€˜n Pay while in the UK, Betterware Ltd are the agents. Ironically, on its website, Betterware states: â€œSorry, this seller doesnâ€™t deliver to Zimbabweâ€. Usabco lawyers insisted on treating the matter as a patent infringement case, â€œsimply to cloud the issue yet Usabco Industries/Addis SA asked for a sample and a sample was provided in good faithâ€ says Shangazhike. He engaged a lawyer, but had to discontinue the process due to prohibitive legal costs. He was advised that the courts would require more evidence than the correspondence and sketches he had supplied. Usabco could not be reached for a comment. Recently, an organisation called Money Book Capital Trust (MBCT) alleged that Econet Wireless Zimbabwe had stolen its mobile savings scheme mainly targeting low-income womenâ€™s grassroots groups. The EcoCash Savings Club was launched on May 6 and is a new mobile product supporting informal savings groups in Zimbabwe. MBCT alleged that Econet stole its concept through middle-rank managers with whom the concept was shared. Volumes of documents availed to The Zimbabwean showed that MBCT shared its mobile savings idea with staff from Econet and Ernst and Young years before the mobile services provider launched the scheme. Econet denied stealing the idea.